What do you do if you are hosting a Galilean Nights event that involves night sky observation and the weather report is not cooperating? Several groups hosting events worldwide are also going to use twitter and facebook to report what they are seeing: you can follow them and what they are doing! Look out for the #GalileanNights tag. 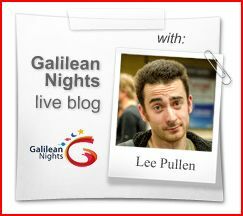 IYA2009 staff writer Lee Pullen will be live blogging on the Cosmic Diary web page http://cosmicdiary.org/galilean_nights, which is also available via rss feed [feed://cosmicdiary.org/galilean_nights/?feed=rss2], reporting about Galilean Nights events happening around Munich, Germany. The fascinating night sky is not always cloud free, but our immense curiosity about it, and about the Universe we live in, never goes away. So be creative and find out more about Jupiter, the Moon and the Stars, just as Galileo did 400 years ago!